The rising threat of global warming has led to tensions about many natural processes on Earth going awry, processes that we once took for granted. One of these is the availability of freshwater on our planet. We’ve already seen increased droughts and rivers drying up as a result of changing climates. What’s next? Will we eventually run out of water? The answer isn’t quite that simple. The Earth is made mostly of water, so it would take a radical and unprecedented event for ALL of that water to dry up. However, much of this is saltwater, which is unfit for drinking. As far as freshwater, our planet has processes to keep this water cycling around. However, some supplies may be depleting, as we may be using too much too fast. Some of our sources of freshwater are more at risk than others. One of these is our underground aquifers, which provide us with 35 percent of our water. According to data collected by NASA’s GRACE satellite system in 2015, 21 of the 37 largest aquifers in the world have had more water taken from them than was replaced during the 10-year study period. These aquifers are replenished by nature through rain and melting snow. However, it can take thousands of years for them to refill completely. If we are going to conserve our precious freshwater supplies, we need to find ways to either clean water of pollution, use less of the water we have, or both. We also need to find ways to get fresh water to the people who need it most. Always make sure the tap isn’t running when you brush and floss your teeth. Make sure each laundry load is full, to avoid doing more washes than necessary. Ensure that there are no leaks in your faucets or drainpipes. Don’t defrost frozen food under running water. Put it in the fridge instead. It may take longer, but it won’t waste water. Install a low-flow toilet in your home. Put your sprinkler system on a timer if you need to use it. Water is one of our most precious resources. Do you have any other ideas to help conserve the water we have? 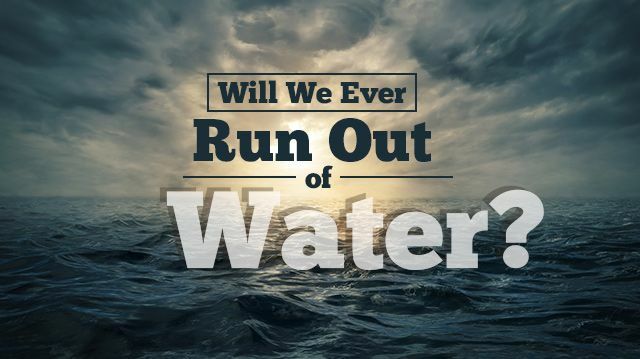 Hey Buddy!, I found this information for you: "Will We Ever Run Out Of Water?". Here is the website link: https://www.thealternativedaily.com/will-we-ever-run-out-of-water/. Thank you.